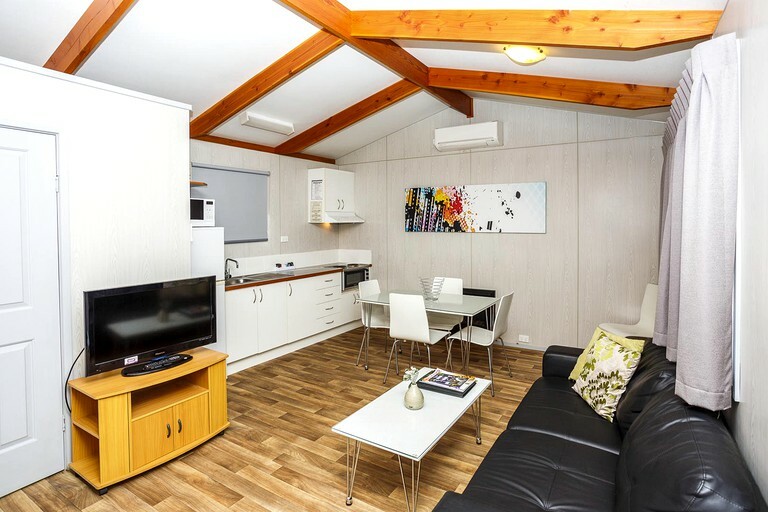 These family-friendly and pet-friendly cabin rentals are located in a beautiful glamping park near Bright, Victoria, and each can accommodate either four or five guests depending on the cabin. There are two bedrooms and one full bathroom. In the first bedroom, glampers will find a comfortable full-size bed. 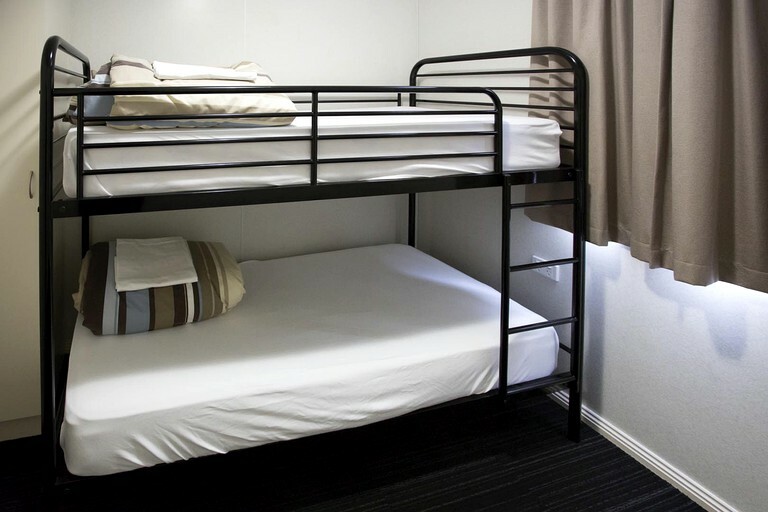 The second bedroom has either a twin-over-full bunk bed or a twin-over-twin bunk bed. In the bathroom, guests will find a toilet, a sink, and a shower. Linens and towels are provided. In the living room, guests can relax on the comfortable sofa while watching the flat-screen television after a long day of outdoor activities. The fully-equipped kitchen comes with a refrigerator, a stove, an oven, and a microwave. Other amenities include a DVD player and air conditioning. Glampers will enjoy all the amenities necessary for a relaxing and comfortable getaway at this unique glamping park. The park features a large solar-heated swimming pool surrounded by sunbeds and spectacular views of Mount Buffalo, the perfect place for guests to relax and enjoy a swim on warm days. Families will especially enjoy the playground for children with a covered area to protect from the sun. The park also has a shared camp kitchen where guests will find two electric barbecue plates, a refrigerator, a stovetop, a microwave, a toaster, a tea kettle, a television, and seating for up to 20 people. Guests will enjoy live entertainment in the camp kitchen at busy times of the year. 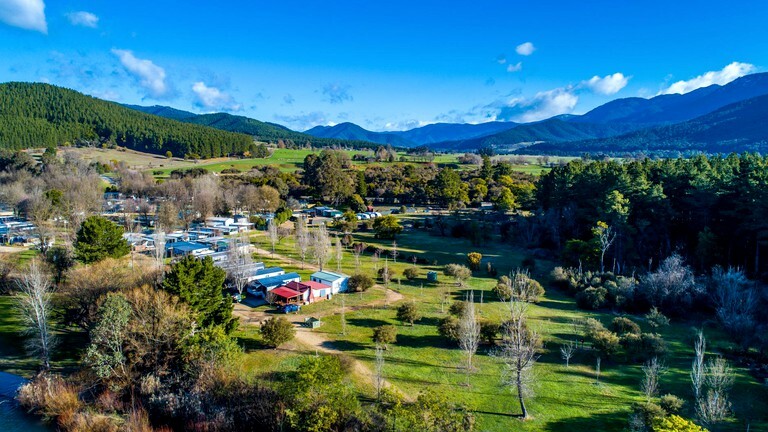 Other amenities include complimentary Wi-Fi, laundry facilities, shared bathroom and shower facilities, two shaded barbecue areas, a kiosk selling local wines and beers, a book-swap library, and direct access to the Rail Trail cycling path and 600 meters of river frontage. The park also has an off-leash dog area for glampers bringing pets. This glamping park offers guests a variety of special services for an additional fee. 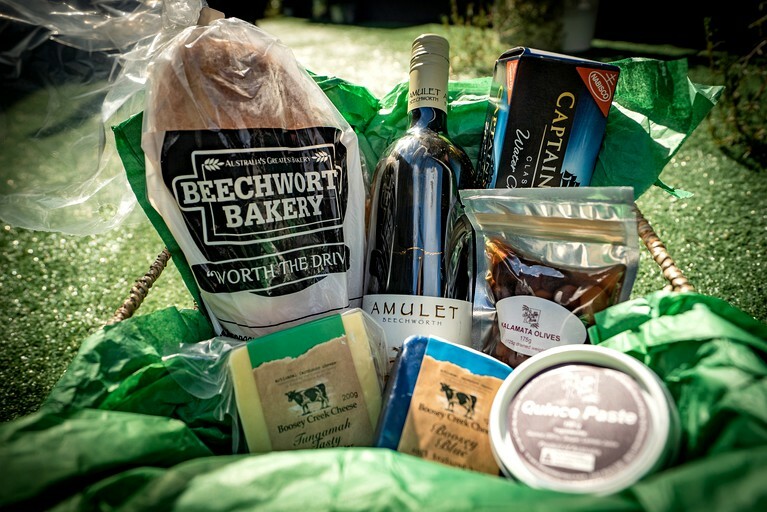 Services include mountain bike rentals, fire pit rentals, and secure short-term and long-term caravan storage. Firewood and marshmallows are also available for purchase. 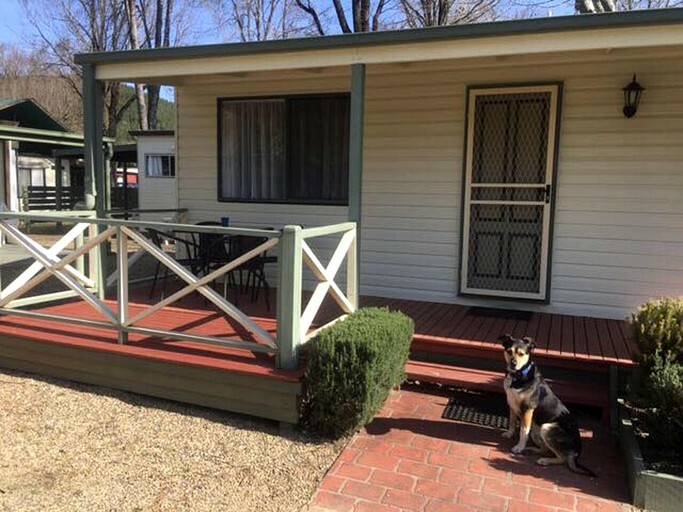 This charming, pet-friendly cabin rental is located near Mount Buffalo National Park in beautiful Porepunkah, Australia. 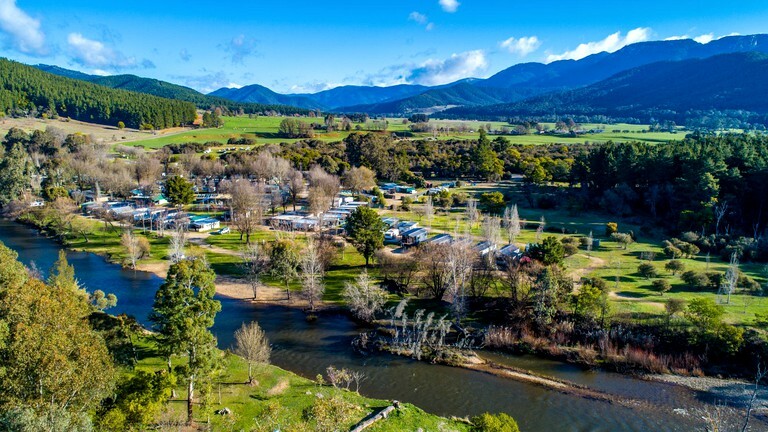 Tucked away in a family-owned glamping park along the banks of the Ovens River, guests will enjoy a breathtaking natural setting for a relaxing getaway far away from the stress of city life. 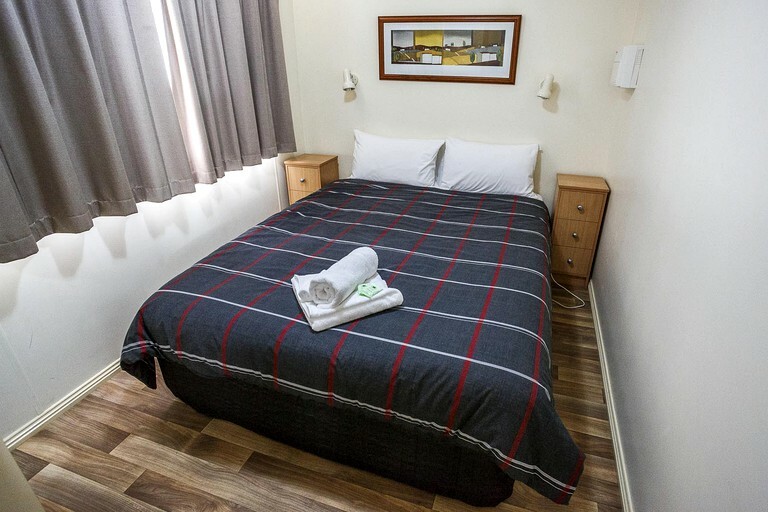 The cabin is situated at the base of Mount Buffalo just a short drive away from the town center of Bright where guests will find a variety of local shops and restaurants. 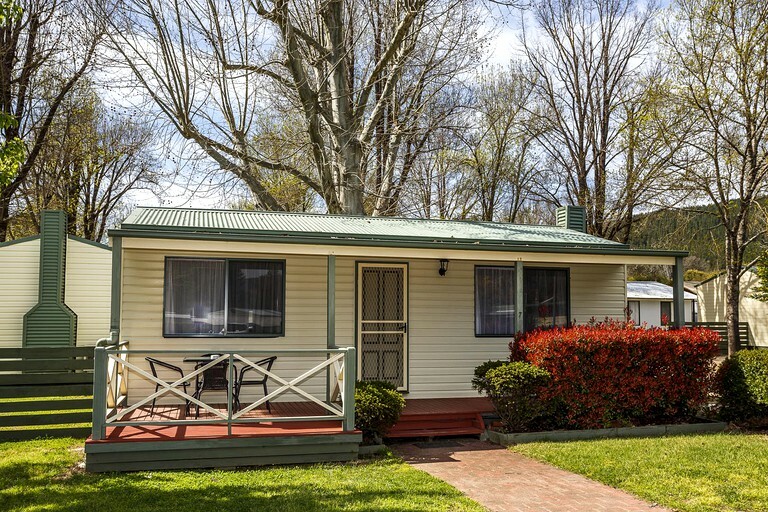 Glampers will also enjoy the ideal base for exploring both Mount Buffalo National Park beside the property and Alpine National Park, located about half an hour to the east. Glampers at this cabin will enjoy countless outdoor activities to choose from all year round. 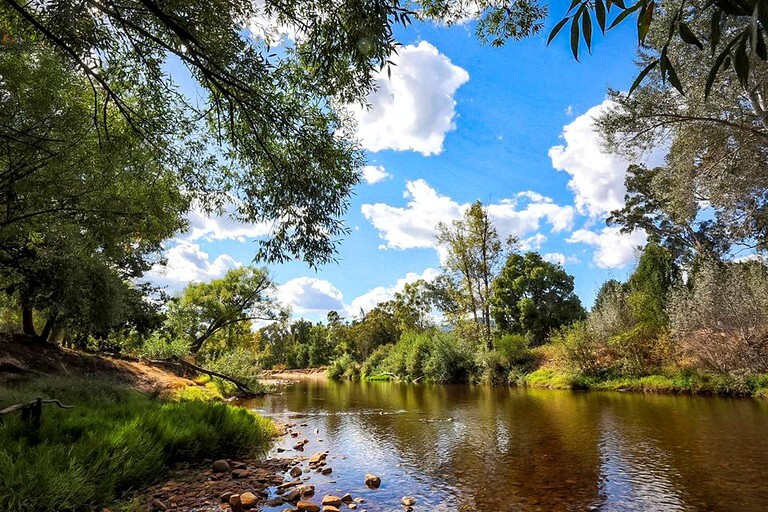 In the summer months, the nearby Ovens River is the perfect spot for a day of fishing, canoeing, or kayaking. 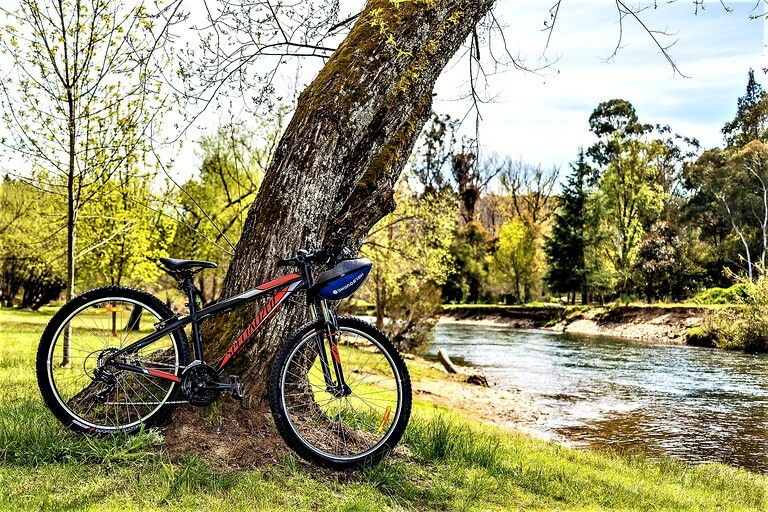 The Mount Buffalo region is also one of Australia’s top destinations for mountain biking. Guests can rent bikes on the property and head out to explore the local trails. 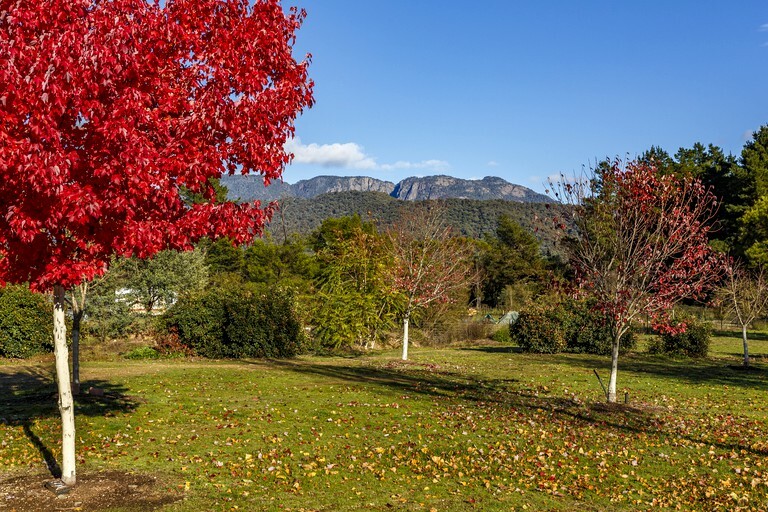 In Mount Buffalo National Park, nature lovers will especially enjoy the extensive network of beautiful nature paths for hiking, birdwatching, and wildlife viewing. In the winter, Mount Buffalo is a wonderful spot for cross-country skiing or snow tubing. Nearby Hotham is the highest area in Victoria and a popular location for skiing and snowboarding at Hotham Alpine Resort. Other popular winter activities include sledding, snowshoeing, and visiting the snow play areas at Mount Buffalo. No matter what time of year glampers choose to visit, there's no shortage of outdoor activities to enjoy in and around Porepunkah, Australia. Dogs are welcome at this cabin. For guests bringing pets, a small nightly fee per pet is required. Smoking inside the accommodation is not allowed. Late check-out is available until 3:00 pm by previous arrangement only. Additional fees apply.